Merry Christmas to all our readers! Here at www.lancashirewalks.com we have been giving some thought to the thorny problem of the Christmas family outing. Because of the season and the endless round of eating and drinking Christmas can be such a confining time that sooner or later someone pipes up, “Let’s go for a walk!” which leads onto the inevitable question, “Where?” and pretty soon you are well on the way to the Annual Christmas Row as the merits of each family member’s suggestion are debated. Fortunately for our readers the solution is remarkably near at hand. Go to one of the many municipal parks located in our towns and cities throughout the north west of England. In this regard pride of place has to go to Preston with seven major public open spaces within the city’s boundaries – there is even a continuous walk linking them altogether though we do not recommend that as a family outing since it is 14 miles long! In case we’re accused of parochialism I would point out that there are splendid parks in Blackpool, (Stanley Park), Lancaster, (Williamson Park), Blackburn (Witton Country Park and Corporation Park), Burnley, (Towneley Park, Thompson Park, Scott Park and Queens Park), Accrington (Oakhill Park and Peel Park), Chorley (Asterly Park, Duxbury Park and Yarrow Valley Country Park) and Wigan (Mesnes Park and Haigh Country Park). This list is by no means exhausted – I know readers will have their own favourite open spaces to add to it. The point is that parks are too easily overlooked as places suitable for a family walk. Suitable because they are near at hand and generally accessible for wheelchairs, mobility scooters and prams. Pushed to nominate a favourite park high on the list would be Worden Park in Leyland. Once the home of the Farington family, Worden Park was taken over by the local authority in 1951. Since local government reorganisation in 1974 it has been managed by South Ribble Borough Council. Covering over 60 hectares it caters for a wide range of community activities – superb children’s play areas, extensive playing fields for sport, historic buildings used by small businesses and local groups and nature trails. It is the only park outside of London to be awarded the prestigious Green Flag every year since that scheme commenced. Start: Main car park, Worden Lane. Time: One hour to do the walk, two to three hours to make use of the attractions and several more hours if you go into the maze. Summary: An easy walk on surfaced paths. 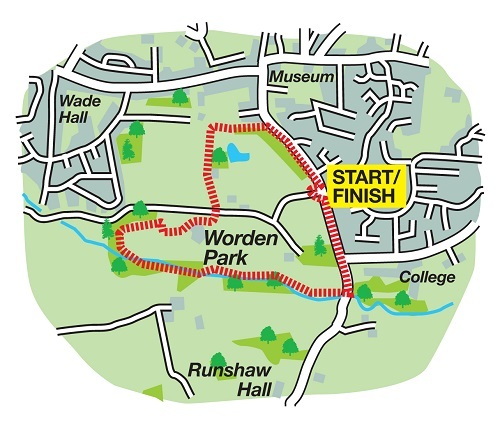 Directions: The first part of the walk is not in the park at all but requires you to return to Worden Lane and turn right walking alongside the old stone walls of the estate. Pass a second entrance and turn right onto a footpath close by Swiss Lodge. You are now on the Shaw Brook Italian Walk created for the Farington family that once lived in the Hall. In about 300yds you will reach the folly which was built in the late 18th century to adorn the small waterfall. It takes the form of an arched ruin. Keep to the main path as it enters a more densely wooded area and then crosses a wooden bridge. After a second footbridge there is a stone shelter on a brow - at one time a summer house. The third footbridge will bring pass a pond and onto a tarmac drive. Turn right. A short distance ahead turn right again onto a stoned path. - a lime tree marks its centre. If you want to extend the walk by 5 miles - enter the maze! If not turn right and walk along the outside of the maze to reach the formal gardens. From here there is easy access into the courtyard and the Arts and Crafts centre and the coffee shop. Follow signs to return to the car park but if you wish to extend your walk cross the playing fields to reach a wooded footpath beyond the children's playground. Turn right to reach Worden Lane. In recent years the garden has been undergoing a programme of restoration and improvement in a partnership project which has included South Ribble Borough Council, the Brothers of Charity Services and numerous other charities and community groups. A significant aspect of the project is to assist people with learning disabilities to develop life skills in an integrated community environment which will enhance their independence. Supported by helpers and volunteers the service users have contributed substantially to the restoration of the garden.